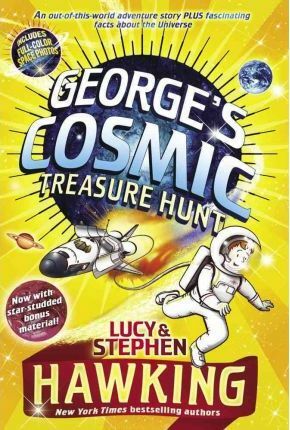 George and Annie explore the galaxy in this cosmic adventure from Stephen Hawking and Lucy Hawking, complete with essays from Professor Hawking about the latest in space travel. George is heartbroken when he learns that his friend Annie and her father are moving to the US. Eric has a new job working for the space program, looking for signs of life in the Universe. Eric leaves George with a gift--a book called The User's Guide to the Universe. But Annie and Eric haven't been gone for very long when Annie believes that she is being contacted by aliens, who have a terrible warning for her. George joins her in the US to help her with her quest--and before he knows it, he, Annie, Cosmos, and Annie's annoying cousin Emmett have been swept up in a cosmic treasure hunt, spanning the whole galaxy and beyond. Lucy Hawking's own experiences in zero-gravity flight and interviews with astronauts at Cape Kennedy and the Johnson Space Center lend the book a sense of realism and excitement that is sure to fire up imaginations. The book includes essays written by Professor Hawking and his colleagues, in which they provide the latest thoughts on space travel. Lucy Hawking, Stephen Hawking's daughter, is a journalist and novelist. She is the coauthor of the George's Secret Key series for kids, as well as the author of the adult novels Jaded and Run for Your Life. She lives in Cambridge with her son. Stephen Hawking was a brilliant theoretical physicist and is generally considered to have been one of the world's greatest thinkers. He held the position of Lucasian Professor of Mathematics at the University of Cambridge for thirty years and is the author of A Brief History of Time, which was an international bestseller. His other books for general readers include A Briefer History of Time, the essay collection Black Holes and Baby Universe, The Universe in a Nutshell, The Grand Design, and Black Holes: The BBC Reith Lectures, as well as the books in the George's Secret Key series. He died in 2018. Garry Parsons is the award-winning illustrator of many books, including George's Secret Key to the Universe, George's Cosmic Treasure Hunt, George and the Big Bang, George and the Unbreakable Code, and George and the Blue Moon by Lucy and Stephen Hawking; Billy's Bucket by Kes Gray; and What's Cool About School by Kate Agnew. He lives in London. Visit him at GarryParsons.co.uk.